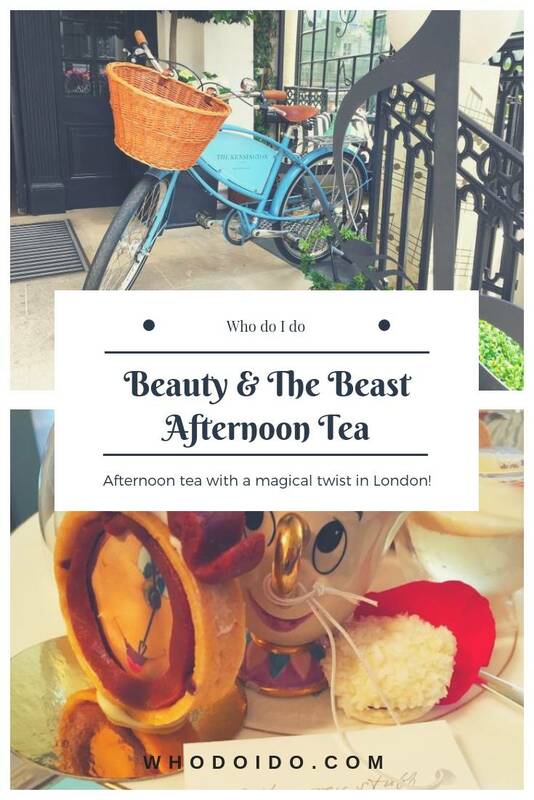 Beauty And The Beast -‘A Tale as Old as Time’- Afternoon Tea! 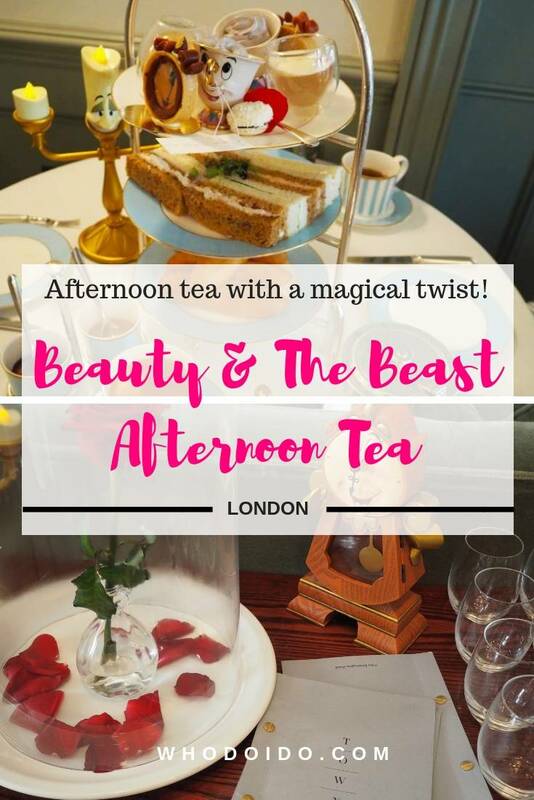 “Oooh, there’s a Beauty and the Beast themed afternoon tea in London. Do you want to go Ian?” I said. Ian gave me the look … the look that said ‘another afternoon tea – just how many sandwiches can you eat’ 😉 “Yes, ok. Go ahead and book” he replied. 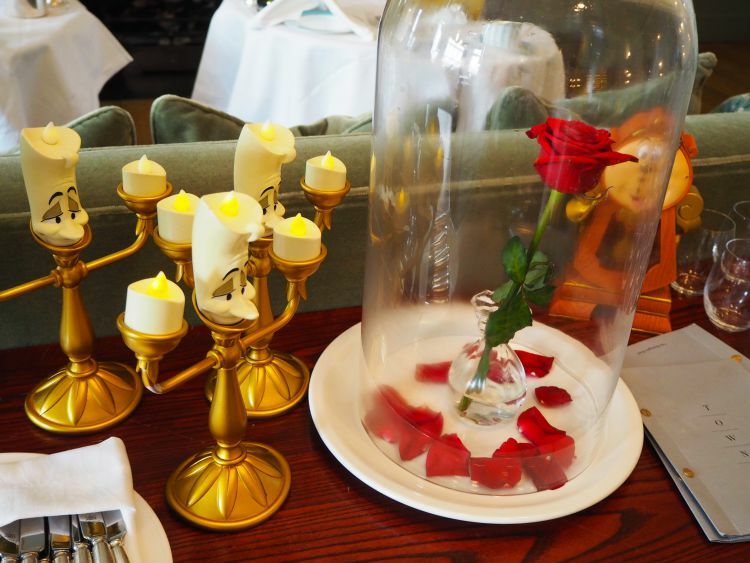 Back in February when the Beauty and the Beast afternoon tea was released to celebrate the ‘Beauty and the Beast film, all the tables were booked up literally overnight. So when I heard that further dates had been released in June 2017, I hastily booked a table mid week for a lunchtime sitting to avoid disappointment. 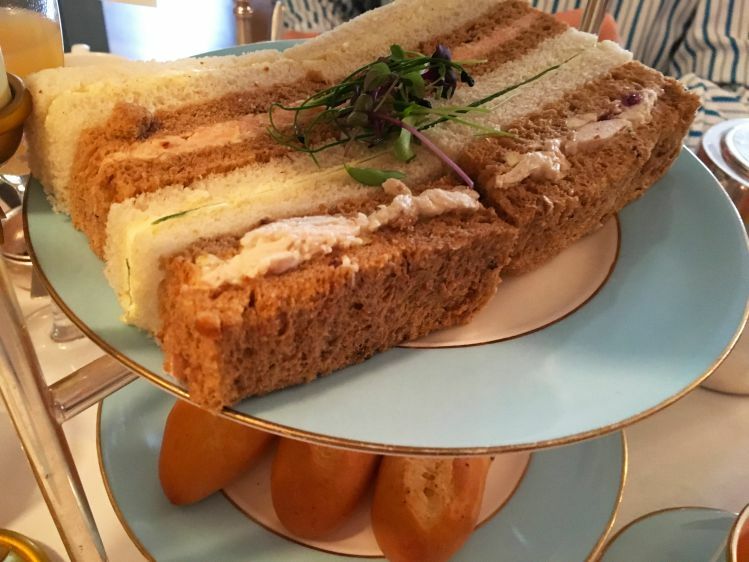 I do love a good themed afternoon tea, having visited the Charlie & the Chocolate Factory afternoon tea at The Chesterfield earlier this year (click here for our review). 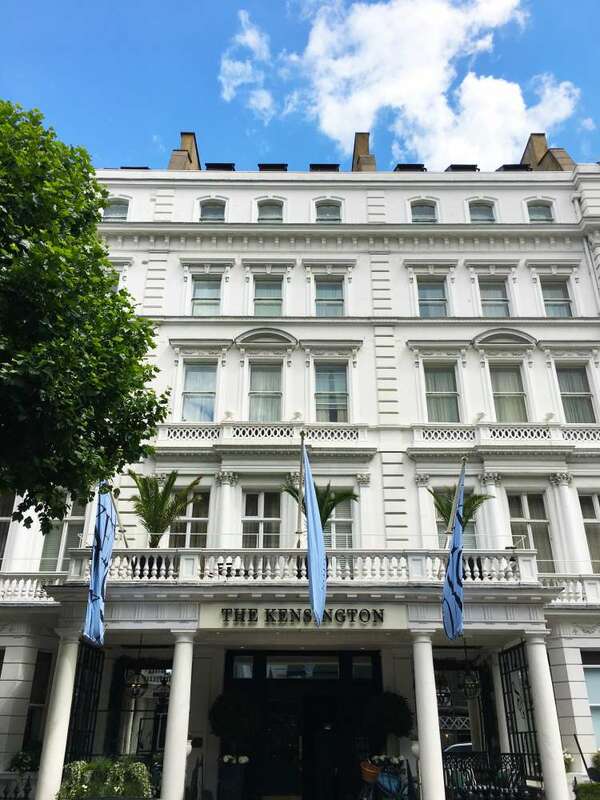 The afternoon tea was held in the Townhouse at The Kensington located in the heart of South Kensington, which was recently refurbished. As we were a little early, we waited patiently in the lounge area whilst waiting for the tables to be ready. 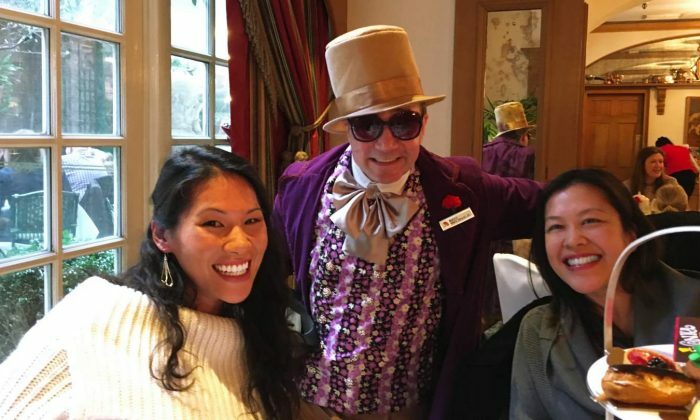 I noticed that there were a few other people also waiting to be seated – a popular afternoon tea indeed. We were finally led to a table near the corner of the room. The dining room was bright, elegant, sophisticated with the simple contemporary chandeliers hanging from the ceiling. I loved the comfortable subtle colourful chairs in contrast with the crisp white ironed table cloths. 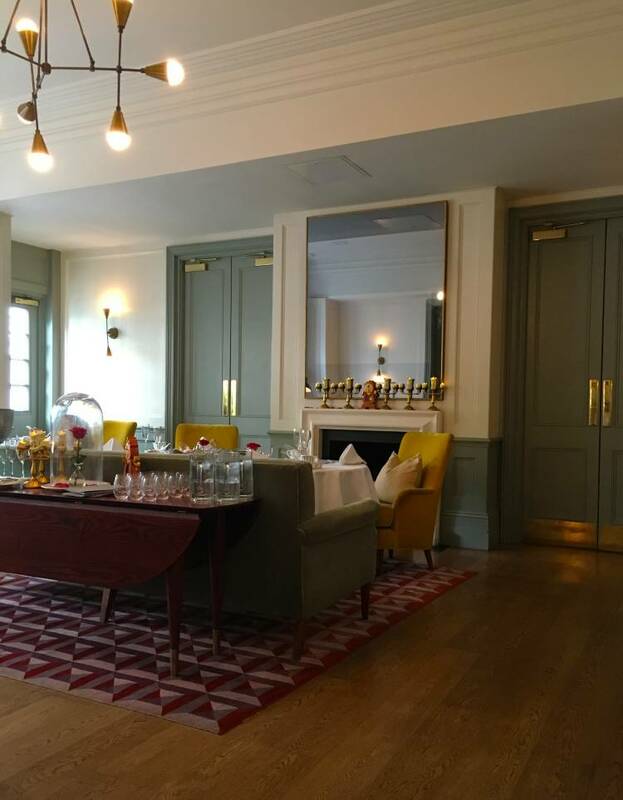 The tall ceiling and huge bay windows allowed the natural light to shine through, which gave a sense of calm to the room and a relaxed ambience with light piano music playing in the background. 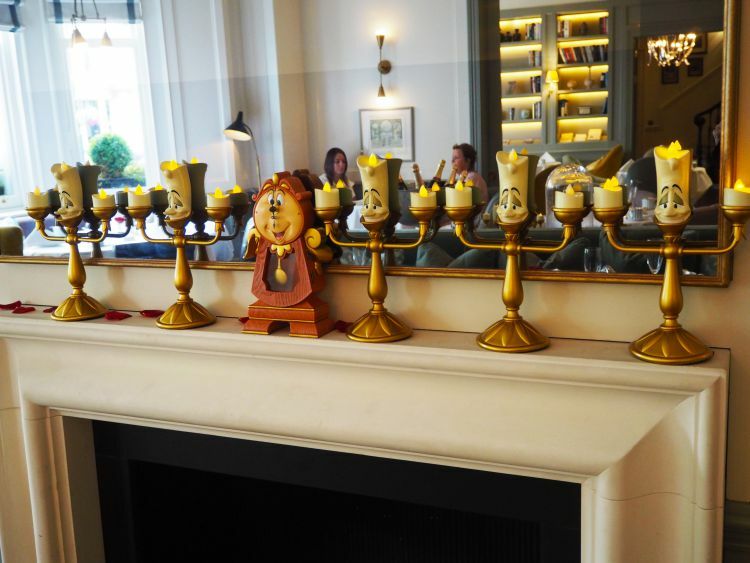 The themed props were perfectly placed in the centre of the room and a row of Lumières on the mantle piece. 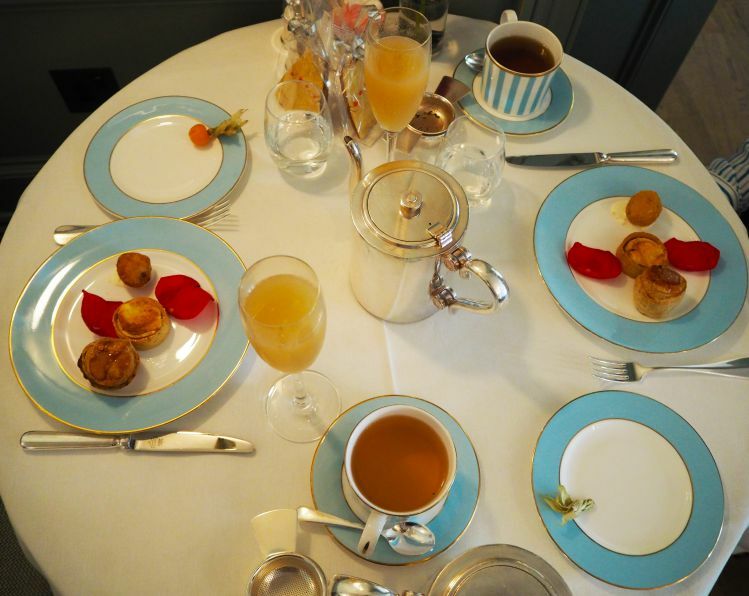 The table setting was beautiful with pastel blue and white side plates and the blue and white striped cups – how quintessentially English. We ordered a bellini to start whilst browsing the tea choices. 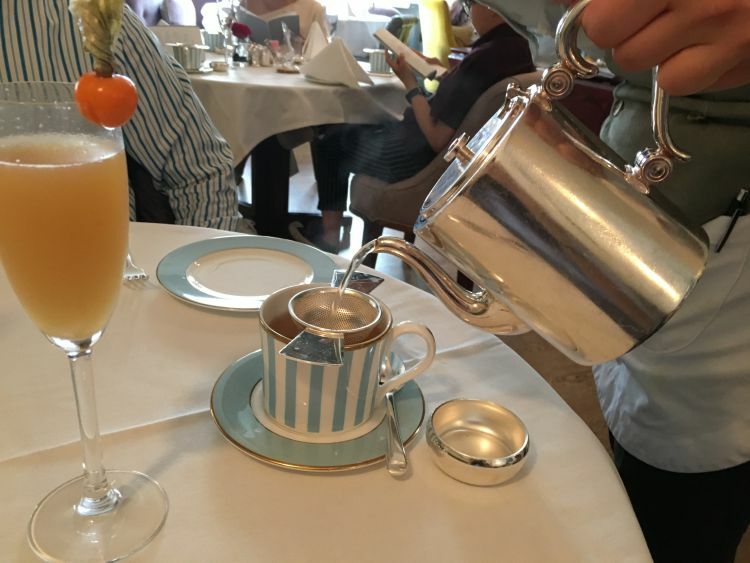 The bellinis were lovely with the sweetness of peach purée and the bubbles from the Prosecco giving a refreshing taste and decorated with a physalis on the side. 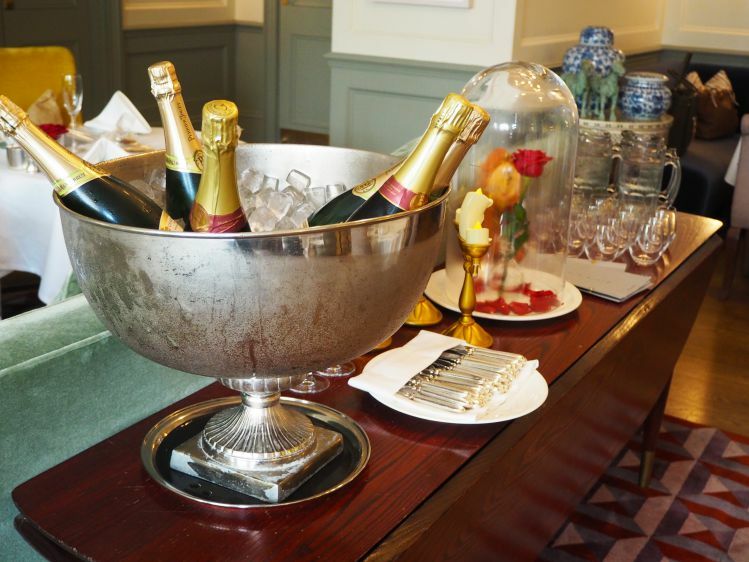 What girl doesn’t love prosecco?! We finally decided on our teas, Dragonwell green tea for me and a Malawi spearmint for Ian. 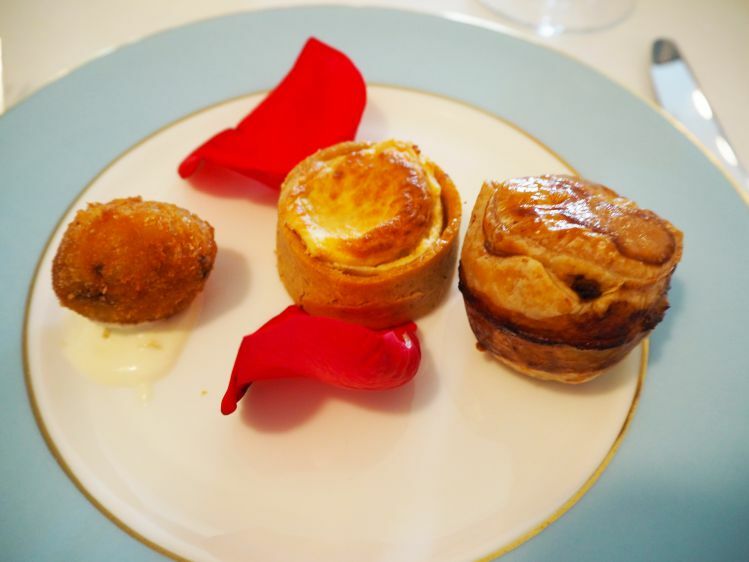 First up were the bite size savouries of venison pie, beef ragu and saffron arancini and the cheese soufflé. The pastry of the venison pie was lovely and crisp, however we felt that the venison lacked a bit of seasoning. The arancini was heavenly and packed full of flavour with the lemon crème fraîche (I wished I could have had another!). Ian and I both loved the cheese soufflé, delicate in flavour with a light crumbly pastry. Luckily we both had our own plates of savouries, otherwise we would have been fighting over these! Once the savouries were gobbled up, a three tiered stand of sweet pastries, finger sandwiches and baguettes was brought out. The server explained each plate in detail in how it was related to a scene in the film and also took photos of us with the theme props. 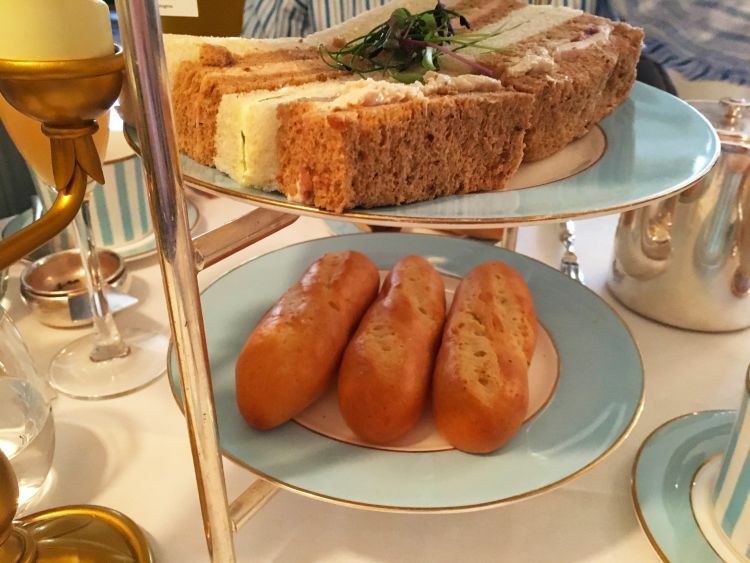 The scones were replaced with brioche baguettes, representing the bakers and the petal in the jelly represented the last petal to fall. 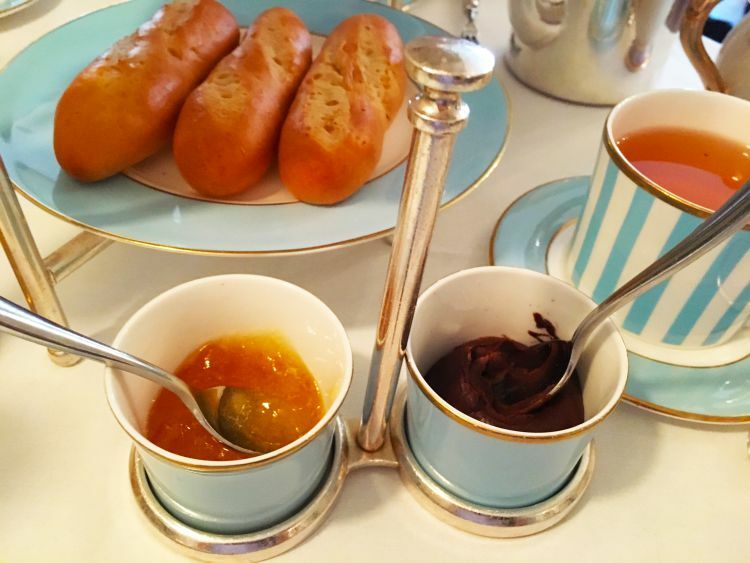 The sweet baguettes were lovely and soft with a hint of sweetness, accompanied with both a chocolate pot and an apricot preserve. Ian preferred the apricot preserve with the baguettes and I on the other hand was drawn to the indulgent chocolate pot. All the sandwiches had a generous amount of filling sandwiched between the soft bread. The cucumber and cream cheese and the egg mayonnaise were scrumptious – nice and delicate in flavour. The salmon was slightly on the saltier side for us and had a slightly overwhelming fishy taste. Our favourite was the chicken and cranberry! Tasty meaty bites of chicken complimented by the sweetness from the cranberry. The sandwiches were so good that we ordered another three plates. 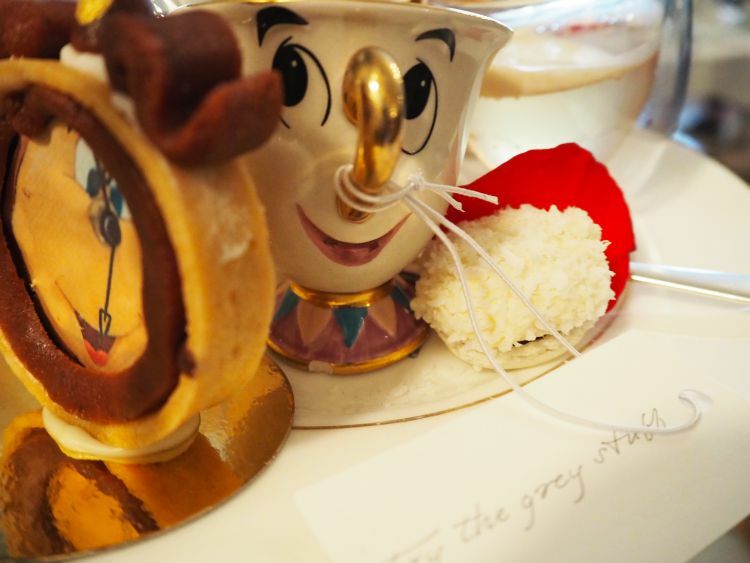 The divine chocolate ganache clock with a face of Cogsworth and the smooth and creamy ‘Try the Grey Stuff’ white chocolate mousse served in a dainty Chip mug, are related in the scene where Lumière sings Be Our Guest. I’m a huge fan of macarons and this one didn’t disappoint at all! A sweet coconut covered in a light sprinkle of dessicated coconut. 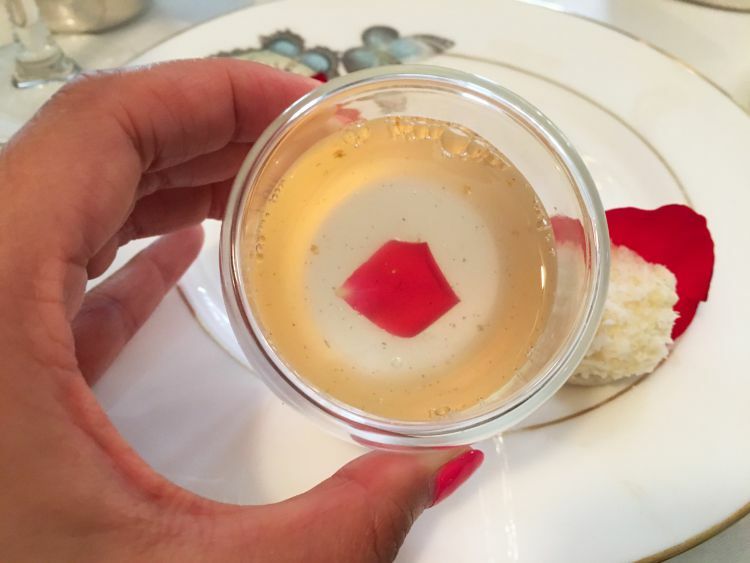 We were advised to pour cream from Mrs Pott’s tea pot onto the vanilla and gold jelly, however this was flavourless for us. The pretty marzipan biscuit which we took home with us, was absolutely lovely. The service was very good and the staff were polite and courteous, but we did feel a little rushed when each tier was finished. We loved how the room was decorated with the little touches taken from the film and how the food was referenced to certain scenes. When our bill arrived there was a slight error as we were charged £9.50 for each additional refill of sandwiches, despite being told by the server that all the refills were free. Apparently only the first plate of refills was free however, after a somewhat protracted discussion with the manager, the additional charges were removed from the bill. 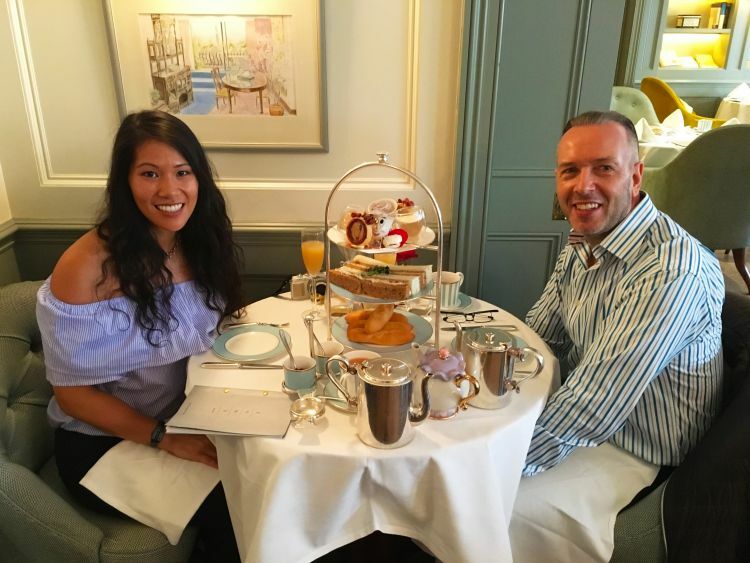 Aside from the error with the bill, the afternoon tea with a twist was lovely. Tip: The sitting is 1 hour 45 minutes and only the ‘first’ plate of refills is free. 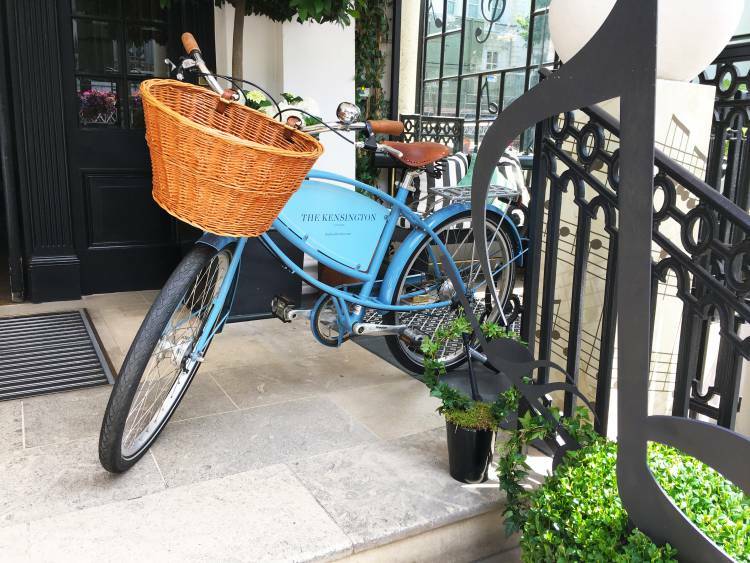 Price: £35 per person with a selection of teas or £45 with a glass of champagne. 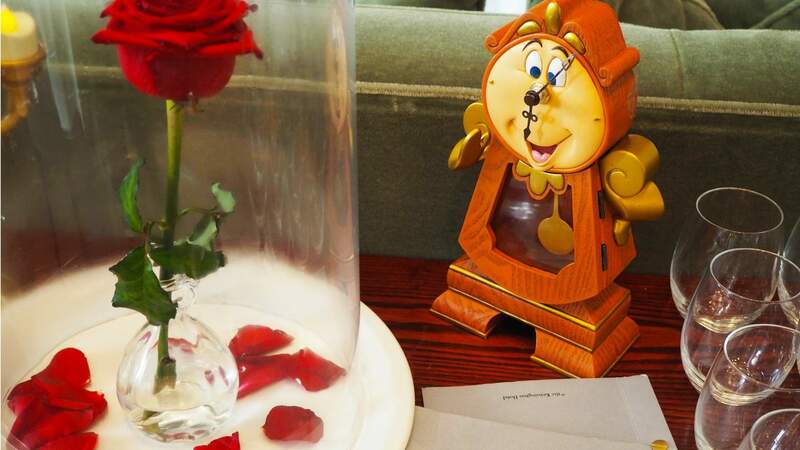 Have you been to the Beauty and the Beast afternoon tea? 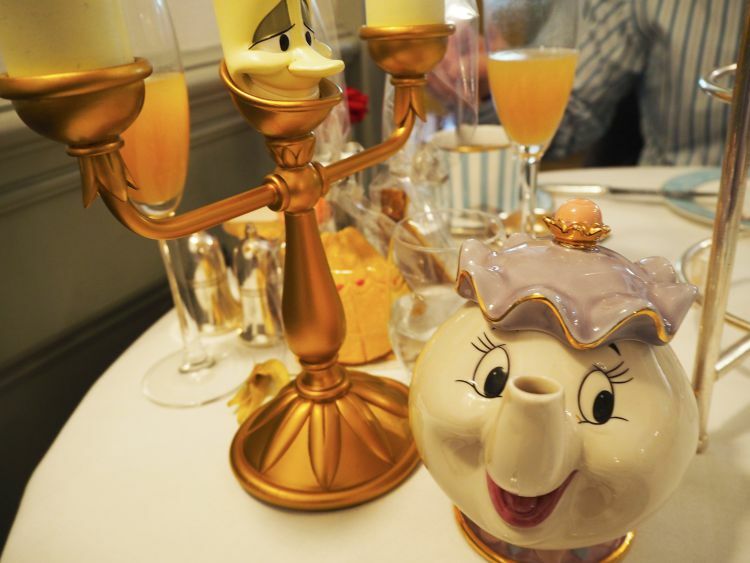 What’s your favourite themed tea? OMG if I am ever in London again I am definitely doing this! How fun! Oh goodness! 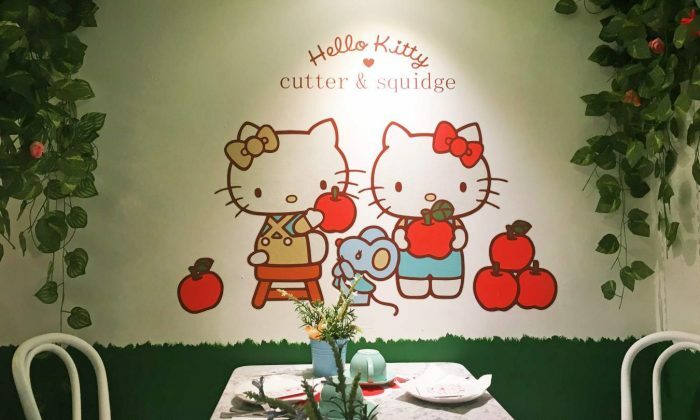 Even though I am an adult, this themed tea looks so fun! And I can’t not hear Angela Lansbury’s version of the song “Beauty & the Beast” when I look at these photos. 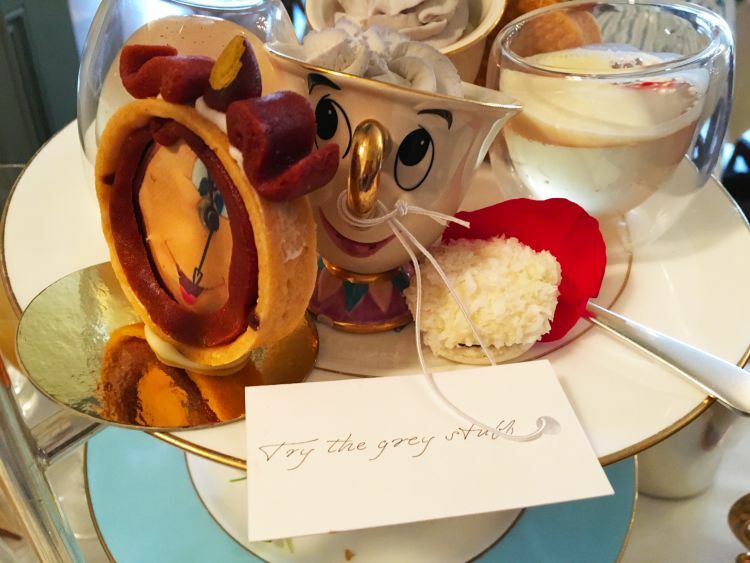 Thank you for sharing this special tea! 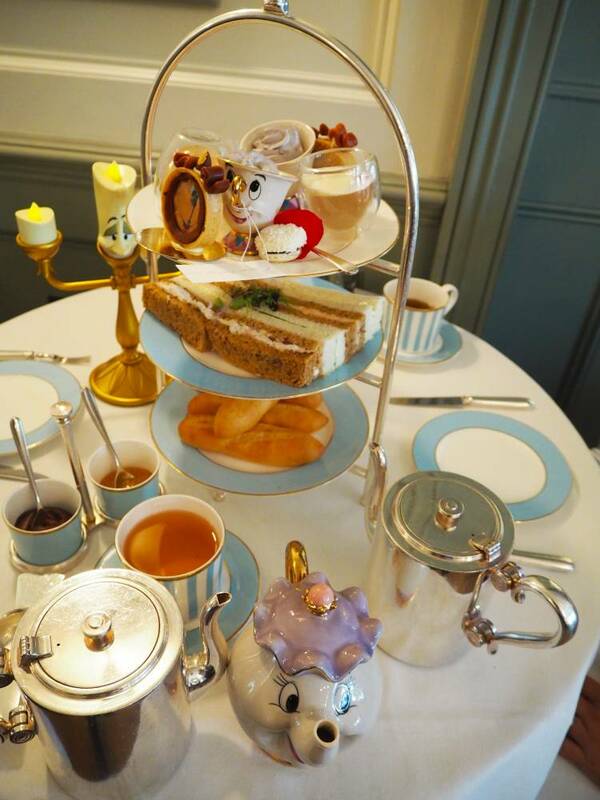 I would love to go to this Afternoon Tea! We definitely need one of those in the states! Oh my goodness I love, love, love, the decor. So cute! I loved how the themed props were dotted around the room! Lovely Lana! 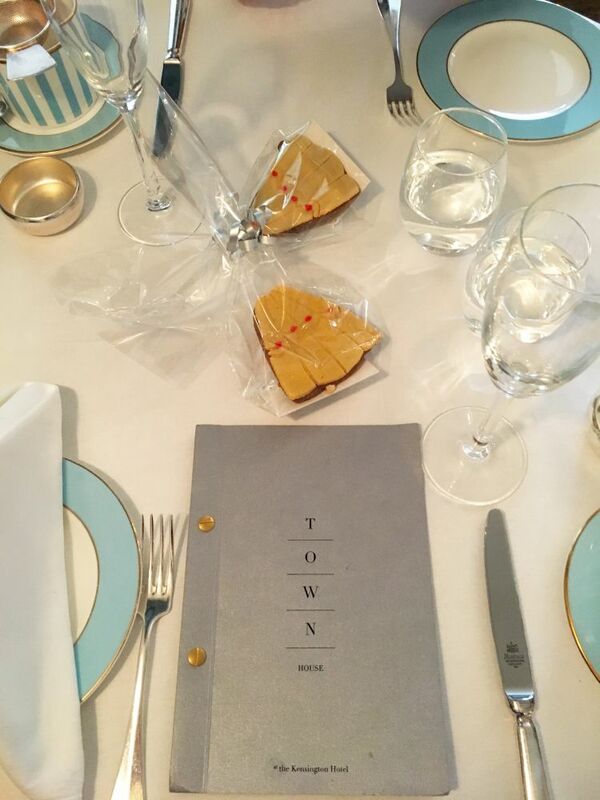 I love a themed afternoon tea. All looks so yummy! P.S My husband is an Ian as well. I miss being in London. Oh my! This is absolutely adorable! I would love to go to this tea house. 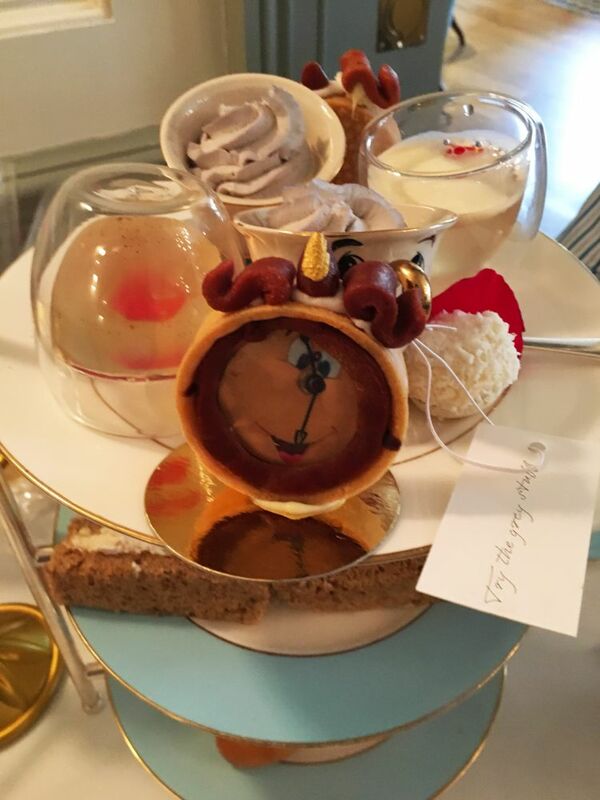 That ganache Cogsworth is adorable and I would have felt awful eating it. I would be apologizing to the actual dessert. Lol. I may have missed it in your post since I was enjoying the pictures so much, but can you buy some of their Disney decorations? This looks wonderful! London is on my mind since a friend and I are trying to visit next year and Beauty and the Beast is the theme of my soon to be 6 year old’s birthday party. how crazy that I could stumbled upon this post! love it! Oh. My . God. – That looks amazing! If they ever did something like that here in Palmy, I would literally jump through hoops 😀 Beautiful pictures and what a wonderful review. Really enjoyed this, thanks for sharing!